Nearly everyone has been hurt by the actions or words of another, creating wounds that in some instances go very deep. These wounds can easily leave you with feelings of anger, bitterness and even vengeance. 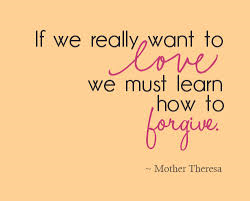 Thing is, if you don’t practice forgiveness you may be the one who pays the highest price. By embracing forgiveness you embrace inner peace, faith, love and gratitude. To practise forgiveness in a certain situation demands an active decision to let go of resentment and thoughts of revenge. It doesn’t mean that you excuse the act – everyone has responsibility for their own actions, good or bad – it simply means that you choose to focus on the positive parts of your life. And strange as it may seem, sometimes forgiveness leads to some understanding and compassion for the one who hurt you. At times it may even lead to a deeper more loving relationship between the two individuals involved, the bond has grown stronger.